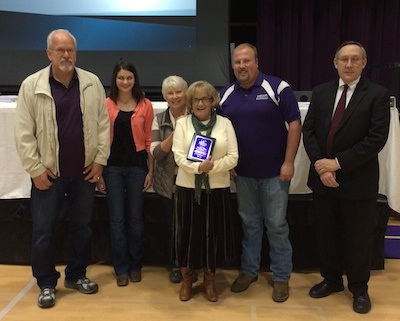 Denair Unified School District board member Louisa Allen was honored for twelve years of service at the November meeting, held in Denair Middle School’s Coyote Center. She was presented with a plaque, thanking her for her service to the district, by Dr. Walt Hanline. Allen served three terms, starting in December, 2001, running through November, 2013. Prior to serving on the board, Allen was a paraeducator at Denair Elementary School for twenty-four years, directly serving hundreds of Denair’s students. While Allen isn’t a product of Denair’s school system, all three of her children, as well as three of her grandchildren, attended school in Denair. Allen said one of the things she’ll most miss is handing diplomas to the 2014 Denair High School graduating class in June. At the December, 2013, meeting, Sandi Dirkse and Kathi Dunham-Filson will join the board, bringing it back to five trustees. The board has been operating with four trustees since the resignation of Julian Wren, earlier this summer. Posted in News and tagged DUSD, school board. Samantha Rocha liked this on Facebook. Alicia Mendoza Mendes liked this on Facebook. Richard Lindo liked this on Facebook.